Number 5 is from menswear brand Burton - never expected to be blogging about this company but I spotted a girl wearing this in Soho last week and asked her where it was from. Number 6 is a cheat from Hobbs as I already own it (outfit post here) but as it fits the bill and is one of my favourite purchases of the year, I couldn't leave it out. Lastly, and by NO means least is this lovely white fairisle knit from Paul by Paul Smith - for the quality I can't quite believe it's under £200... Which is your favourite? I love number 4 and 5...who'd of thought it would be from Burtons? 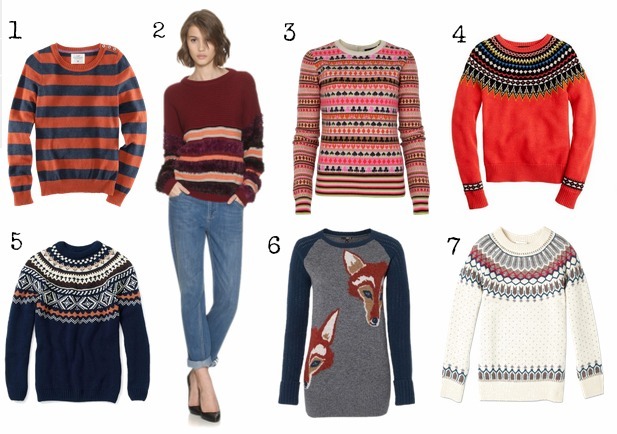 Men always seem to get the best knits!